An unmarked police car sits outside of Dugout bar Wednesday night. The Chicago police investigation into the death of Jacob Klepacz, who died after being found with severe head trauma in Lincoln Park early Monday, continued well into last night. 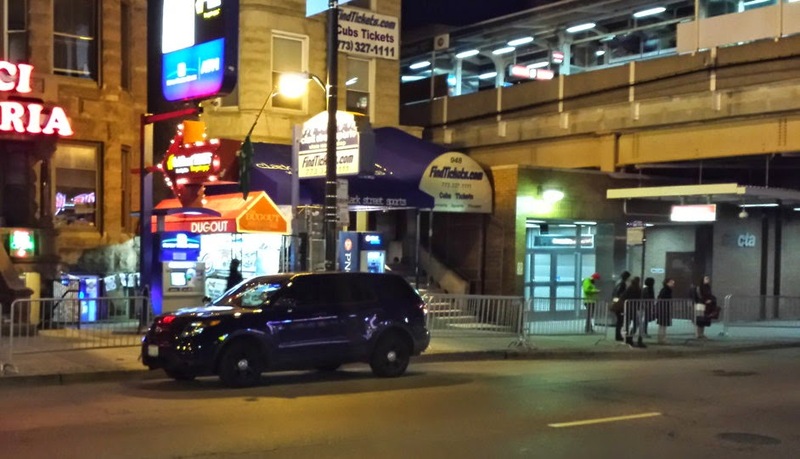 Officers were seen at The Dugout bar in Wrigleville after sunset Wednesday. That is where Klepacz went drinking late Sunday with three strangers that, according to the person who called 911, Klepacz met on the Red Line. After Dugout, one of those three—the one who would later call 911 to report Klepacz being "jumped on" in Lincoln Park—went to a nearby 7-Eleven with Klepacz and then rode with him on the Red Line all the way to the route's termination at Howard. There, a police source tells us, CTA cameras captured the two men "hanging out" on the platform. The 911 caller—believed to be an aspiring filmmaker—has claimed that he could not remember going to Howard Street, nor could he remember how he and Klepacz got from Howard Street back south of Wrigleyville to 1530 W. Fullerton. During a police interview, the 911 caller referred to the other two strangers who went drinking at Dugout as "hustlers" from downtown. Where they went after Dugout has not been shared with us. Klepacz's friends and family are asking anyone who may have information to contact detectives at 312-744-8263 and refer to case HX239937.